Christmas decorations line streets and the shops are filled with people. The morning air is cold as the two women set out for the hour and a half drive on a narrow two-lane country road to visit a relative in the country. “I think we need to head back, I don’t want to get in work traffic,” the daughter announces and stands to leave the relatives home. Hugs and Merry Christmas is offered and the two women leave. Driving the same country road the mother is looking out the window at the tops of the trees. “There’s mistletoe in all of these trees!” she exclaims. 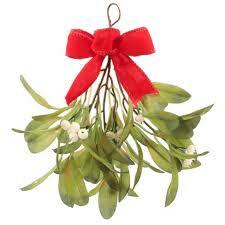 “I want some of that mistletoe!” the mother exclaims. “Stop, stop, stop. There’s some that is low down.” The mother shouts. The daughter jerks the pickup to the side of the road and stops. “Where?” She asks. The daughter backs up and pulls the truck next to a tree her mother is pointing out. On a lower branch a clump of mistletoe hangs enticingly. With the mother’s excited prompting the daughter tries to climb the tree but can’t. She climbs into the bed of the pickup and tries to reach the mistletoe. Her mother hands her a long stick but it doesn’t reach. “Grab that limb, you can climb the tree from there!” the mother insists. A car pulls up behind them and a Man steps out and approaches. “Can I help you ladies?” He asks and smiles at the daughter standing in the back of the pickup swinging a stick at the clump of mistletoe while trying to keep her balance. “I want that mistletoe!” the mother replies emphatically while pointing to the clump of mistletoe. “Let me see if I can reach it for you,” the Man says while climbing into the bed of the truck. “Here, get on my shoulders and you’ll be able to reach it,” the Man tells the daughter. “Are you crazy! ?” the daughter exclaims, but He talks her into it and precariously she balances on His shoulders and grabs the clump of mistletoe. The mother is shouting and clapping in glee after laughing hysterically at the sight of her grown daughter on the shoulders of a strange Man. The truck’s interior is filled with laughter as the two women drive home with a large clump of mistletoe safely clasped in the mother’s hands. “I think God sent that Man.” the mother states eyeing her treasured prize. There’s a saying that if there’s a will, there’s a way. I’m not sure that the scripture used means Jesus will show up and we can stand on His shoulders, but He will give us His strength in doing all things that we are called to do. The story was inspired by a trip my mother and I took and she did insist I climb a tree along side the road to get mistletoe. A fond memory but it also reminds me that no matter what our endeavor Christ is always there to guide and help provided it is within His will and good purposes. Any task we think is impossible is not impossible for our Lord and Savior. Lean on Him, seek Him, and you’ll be surprised when He offers His “shoulders” to stand on.